Hello, I have seen quite a few people post this issue but have seen no one respond about the issue to get fixed I own the rsb-14 soundbar with sub. There is a constant static noise, hissing sound coming from the 2 outside speakers of the bar. I contacted the dealer and got a new replacement soundbar. Yet still the issue persists?? Any reasons as to why? It happens through the optical and the hdmi-arc input. And the power source in plugged into monster power, power source. I'm looking for some help. I'm new to the forums here and am relatively ignorant when it concerns to audio quality. My system right now is an Onkyo TX-8050n. I have this connected to a set of Klipsch RB-51 IIs, a pair Bose 301 Series IV, and a Klipsch R-10SWi. The Onkyo is being fed by a Yamaha CDC-645 CD player, a Technics SL-D303 turntable, and a Chromecast audio, among some other items. I use the Chromecast audio quite a bit with an analog connection (therefore relying on the Chromecast's DAC). I've been noticing that when I play the opening track "I was Glad," of Harry Christophers and the Sixteen's album A New Heaven, that I have distortion when the sopranos hit high notes. I listen to a lot of sacred and classical choral music, and there are other times where there is clipping and distortion, usually when the sopranos are belting out some high notes. I don't notice the distortion so much with orchestral music. At first I wondered if this was a Chromecast issue, but I tried the same CD this morning, and the distortion seemed to be even worse! 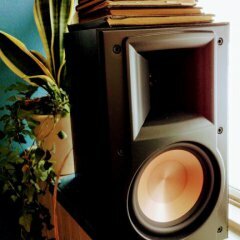 The distortion is (it appears to me) in one of the Klipsch bookshelf speakers. Also, that same bookshelf speaker has a very small dent in the copper speaker (the woofer, right? -- see the photo). What do you think the problem is? Do I need to do something with the tweeter? Do I need to replace the speaker/woofer? Is the problem with my receiver/amplifier? Any help would be greatly appreciated. Thank you!